After another long drive on the bus from Cape Town I arrived in Storms River Village in the middle of the mountains and forest of Tsitiskamma National Park. It was already dark when we arrived (I still can’t get used to having summer weather but an early sunset, it gets dark about 6pm!) so I didn’t really get to appreciate just how picturesque the surrounding were. Loads of people got off the bus at my hostel but turned out they were all in a big group so this was the first time since I got here that I was really on my own, took a little getting used to. The hostel had a fire pit where everyone sat during the evening so I got to talk a little bit to some of the other guests but it wasn’t the same as in previous hostels. Least it gave me chance to catch up on my blog and journal, I’d been slack for a few days. The next morning I was planning on doing loads of exploring of the national park but I spent so long deliberating about the bungy jump that most of the morning passed without me doing anything. 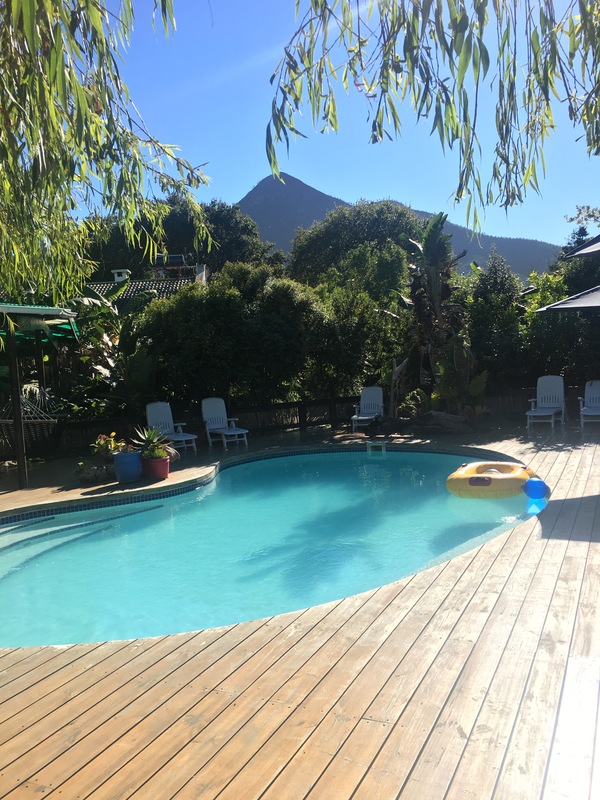 I eventually decided I would jump, I knew I would regret it if I left without doing it as it was one of the things that drew me to stay at Storms River. I was a little unsure about going on my own, nonetheless I manned up and got it booked. At 1:15 I got the shuttle to the jump and as I checked in, got weighed (and had it written on my hand!!) and got my harness I wasn’t feeling that nervous. Even walking over to see the bridge didn’t make the nerves kick in. I got chatting to some of the others who were going to jump and their families which I think helped as it meant I wasn’t standing there overthinking. There were 6 in my group, the youngest a 15 year old girl who put us all to shame. In order to get to the centre of the bridge you have to walk underneath the road in what is essentially a cage. It probably takes about 5 minutes to walk there but felt much longer and I spent the whole time trying not to look down as I knew that would terrify me. Up on the bridge they made us all read out our weight (just what every girl wants!) so they could put us in jumping order; I was 5th. Up first was the 15 year old who didn’t even hesitate before she swan dived off the bridge. No pressure for the rest of us! 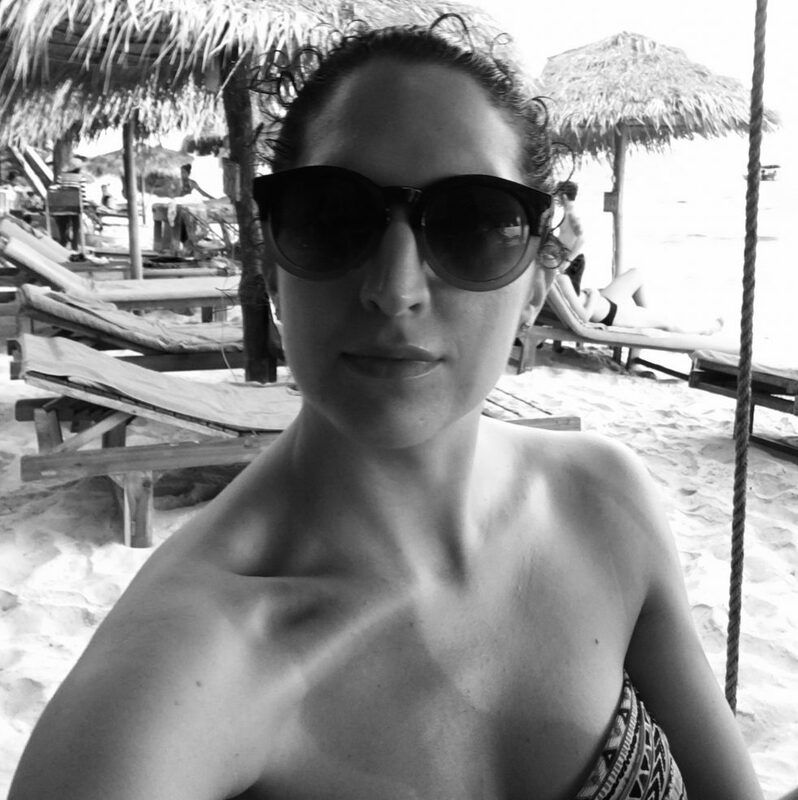 Before I knew it , it was my turn and even as they bound my ankles and attached the bungy I was feeling strangely calm. However the nerves hit me full force as I stepped towards the edge and a full freak out ensued. I was panicking, claiming I didn’t want to do it and refusing to move. The guys were really supportive but were still trying to edge my feet closer to the edge, not with much success. Eventually I started to move forward but by this point I was so flustered and embarrassed that I wasn’t really thinking about what I should be doing next. 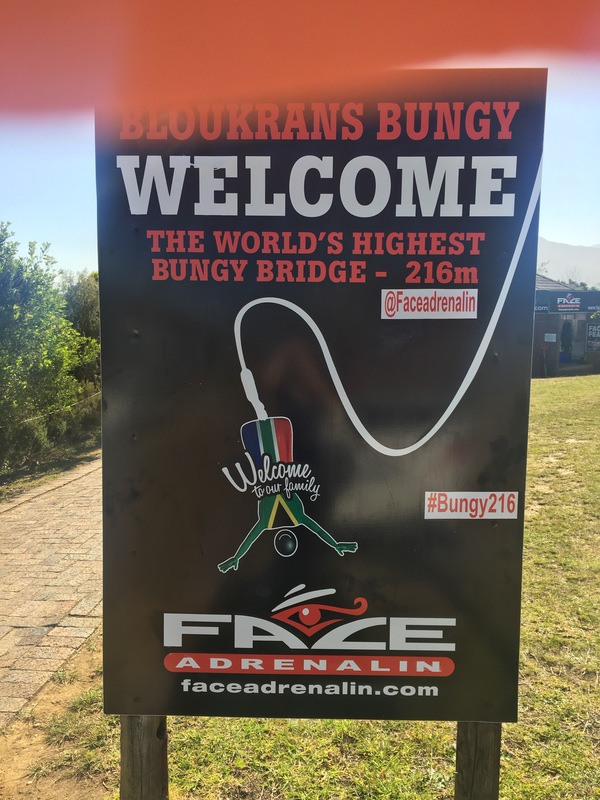 ‘1,2,3, bungy!’ was followed by me essentially falling off the platform instead of jumping, and I’m pretty sure initially not even going head first, in the most ungraceful manner. Trust me to be the clumsy one! The fall was like something I have never felt before, a feeling that can only be described as pure terror mixed with excitement, a tonne of adrenaline and a bit of joy. It felt like I was falling forever and eventually I recoiled back in a much more gentle manner than I was expecting. Swinging back and forth under the bridge, with the blood rushing to my head, I could finally stop for a second and appreciate the amazing view; sea on one side and mountains on the other. The enjoyment didn’t last long however as my brain went back into overdrive and I managed to convince myself that my feet were slipping and I was going to fall (yes I know I’m a drama queen but I was hanging upside down after having my brain shaken up so think I have an excuse!) I have never been so relieved in my life as I was when I saw the man coming to get me. I clung to him for dear life on the way back up and was so happy to get back to the bridge. Initially I had no words to describe it and even now I think the only thing I can say was that it is the worst yet best thing I’ve ever done. I was a little embarrassed by the way my jump went, not helped when we got back to the base and all the supporters and family of the other jumpers started asking me what happened and talking about my unique jump! It was all in good faith though and I’m really grateful for the support from everyone there seeing as I was on my own. Drink in hand I headed back to the hostel to try and recover. That afternoon I finally got to see a little bit of the natural park on a spontaneous hike with a girl from the hostel. The plan was to find the ‘big tree’ but a wrong turn lead to us missing the tree and instead just walking through the woods. After Charlotte managed to convince herself that we were about to be attacked by a baboon we decided it was time to turn back. Not the best hike in the world but least I can say I went for a walk in Tsitsikamma National Park. Charlotte left soon after on the Baz Bus but a girl I met previously on the bus arrived shortly after so I had some company for my last night in Storms River. Storms River was definitely an experience with spending so much time on my own to the bungy but it was worth it. 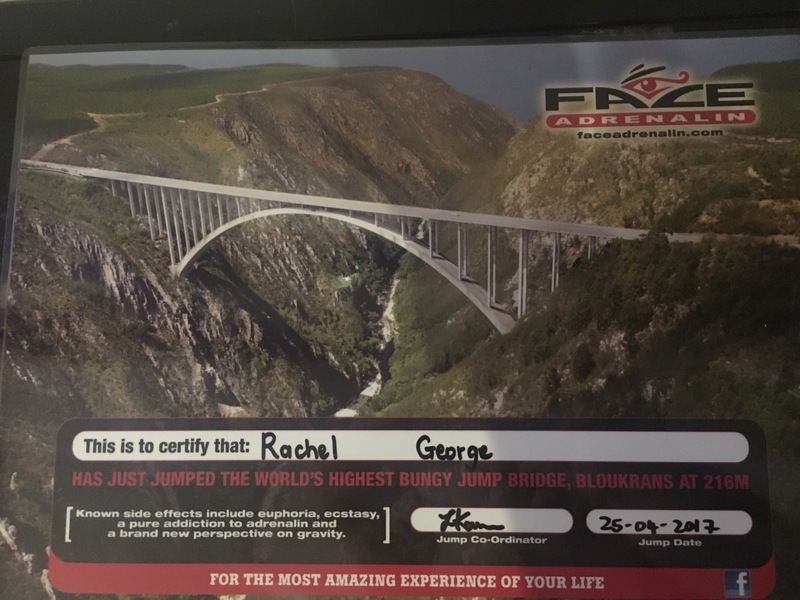 And in regard to the bungy, would I do it again? Definitely! p.s Pictures and video are available via special request!